We could not be more excited to launch our new 2019 products here at Swimways! We’ve got new items for all ages (from babies to grandparents) and all types of waterful fun! Whether you like to float alone or with friends, soak your friends with water blasters, play games in the pool, or you just want to set the mood for your evening pool party- we’ve got it all this year. Take a look! AquaLinx floats literally bring family and friends together! Keep your friends close as you float the day away by connecting these brand new SwimWays AquaLinx floats together! Simply line up the cup holders and connect two or more floats together at the pool, lake or ocean and enjoy quality time with friends and family! These floats also include all the features loungers love! The comfy mesh seat allows water to flow through, helping to keep you cool on hot summer days. This sit-up style float allows you to comfortably float with its supportive backrest! 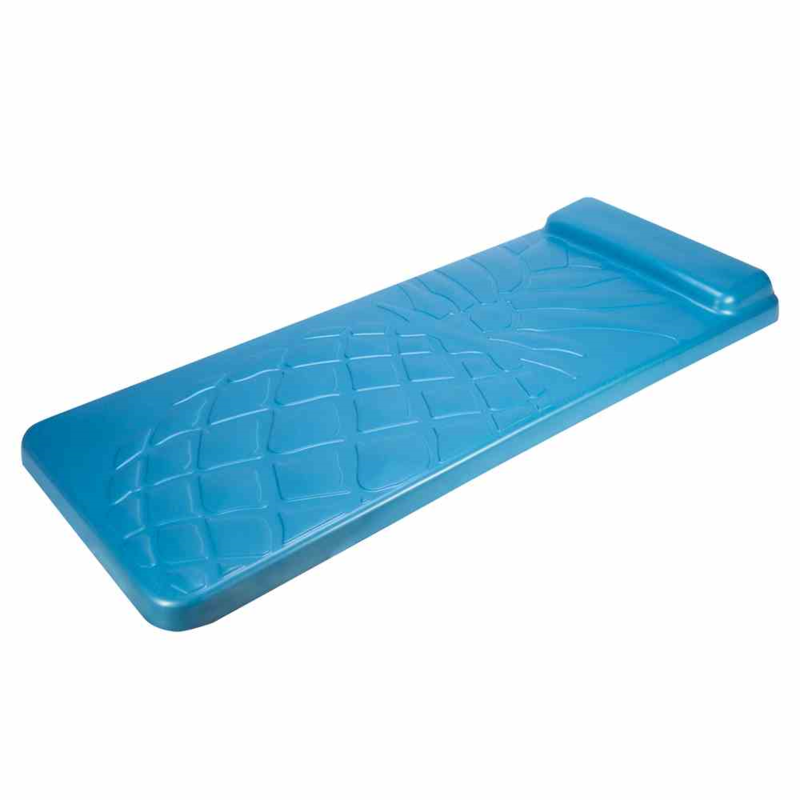 The durable fabric covered flotation provides long lasting usability. The float’s large cup holders allow you to keep your drinks close by so you stay hydrated and are free to enjoy hours of floating fun! Available in vibrant colors that will add a pop of color to every pool! Connect the Floats…Connect the Fun! Age 15+ Sold individually. Take some unBEARably adorable photos as you float on a SwimWays Huggables pool float- Teddy Bear, Sloth or Panda! They are irresistible to all ages and are the perfect pool floats for Instagram-worthy photos! Strike a pose and take a selfie on this oversized and enormously fun Huggables teddy bear pool float. Wrap its arms around you as well for added stability in the water and comfort. These are the only pool floats that will “hug” you! You can also stay hydrated and save yourself valuable floating time by keeping your beverages within reach when you use the convenient cup-holder that is included in the bear’s paw. For ages 5+. Sold individually. 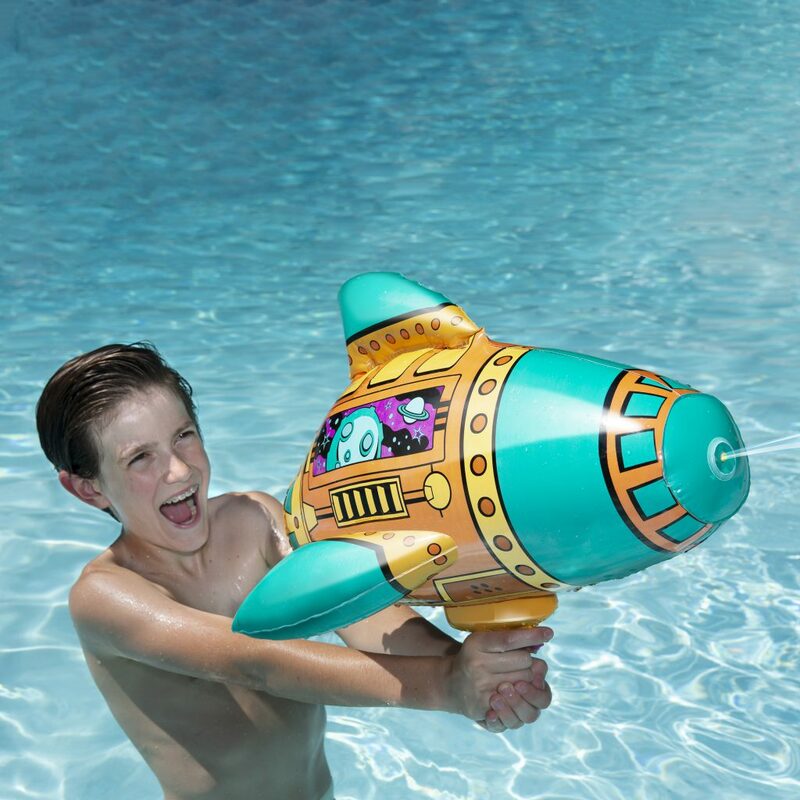 The SwimWays Blow up Blaster- Space Blaster and Shark are inflatable hybrid water blasters that inflate up to 2 feet long. The squirt gun comes in fun, bold graphics with characters kids will love. The Blow Up Blaster can be used both in and out of the pool and has the capacity for 1.5-ounces of water outside the pool, while having endless water ammo inside the pool. 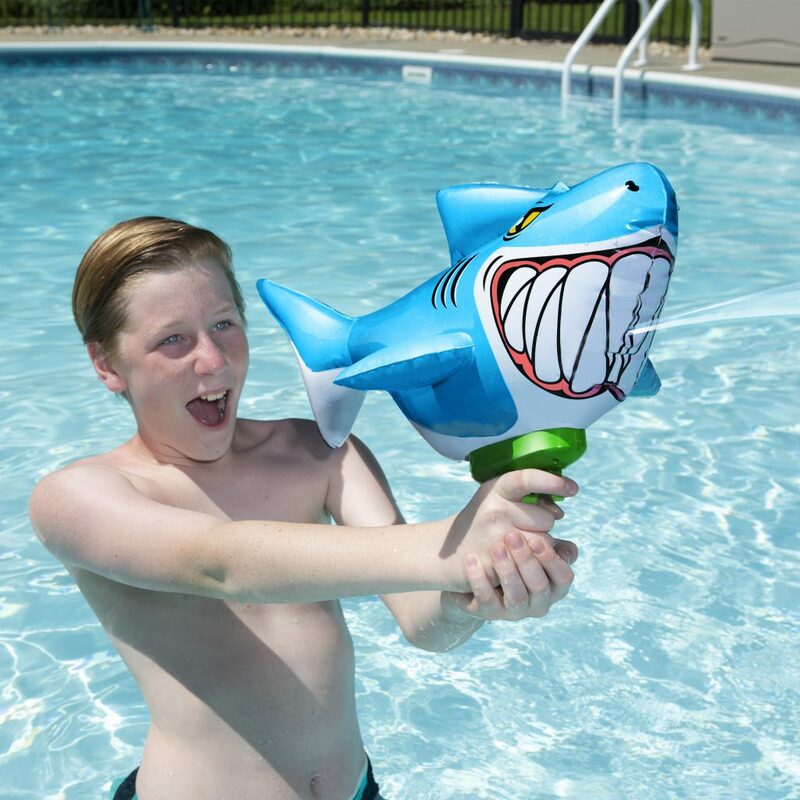 The inflatable character graphic combines an easy-to-use squirt gun with a trigger that shoots water up to 15 feet. Kids can enjoy the water blaster on hot summer days with friends- perfect for pool parties! Assorted styles sold separately. For kids age 5 and older. 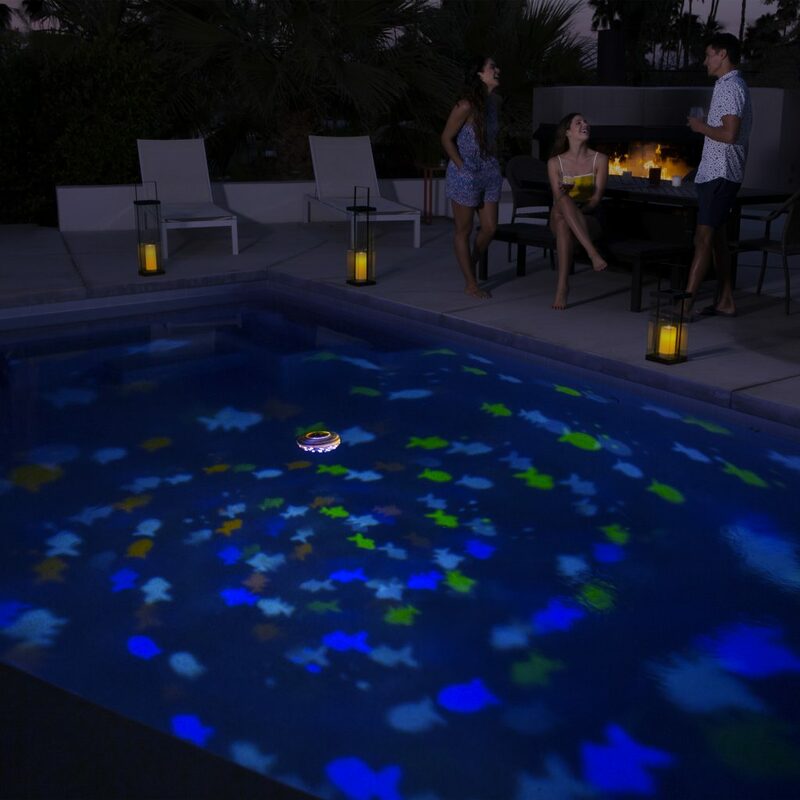 Give your pool some pizzazz with the Rainbow Reef Aquarium Pool Light™! Place it in your pool and it will float as it creates instant aquarium ambiance! Your kids, neighbors, friends and family will all have a blast watching the colorful fish silhouettes (and a shark silhouette) appear to swim around the bottom and sides of your pool! As the light floats in the water, the fish will appear to swim! Enjoy swimming with the fish or watch them from the side of the pool as you enjoy some quality time with friends and family. The fish appear in multiple colors and 3 magical light modes. Enjoy this beautiful light display with the added bonus of amazing your loved ones! Introduce your baby to the pool in the SwimWays Baby Spring Float Splash Station with Canopy baby float! The baby float includes interactive water toys when activated, squirt and spray water for fun pooltime play with baby. In between the two water toys, there is a mesh baby sippy cup holder convenient for parents and baby. Designed to provide a more comfortable and secure water introduction experience, the Baby Spring Float is the only pool float for babies with a patented inner spring sewn into the float all along the edge of the outermost inflation chamber underneath the fabric cover. This spring adds stability to the float in the water, giving parents an added peace of mind. The removable sun canopy offers a shady spot with UPF 50+ sun protection, and the mesh sides of the canopy allow you to maintain eye contact with your baby at every angle. The brightly colored inflatable baby float has fabric-covered inflation for added durability and a soft mesh seat with leg holes for comfort. A wide base, child safety valves, and dual air chambers ensure security. The Baby Spring Float Splash Station folds flat into three compact circles, making it a great choice for travel or trips to the neighborhood pool. This Baby Spring Float makes a wonderful baby shower gift for new parents- giving parents the opportunity to bond with their child in the water as he or she grows. The Baby Spring Float Splash Station with Canopy is part of the SwimWays Swim Steps learn to swim program. Swim Step 1 supports babies and toddlers as they are introduced to the water, helping them stay comfortable and happy. Includes a reusable carry bag. For babies age 9-24 months. Sold individually. Introduce your baby to the pool with the SwimWays Mickey Mouse or Minnie Mouse Baby Spring Float Sun Canopy baby float! The Baby Spring Float is designed to provide a more comfortable and secure water introduction experience for your child and is the only pool float for babies with a patented inner spring around the outside edge for added stability in the water. The removable sun canopy provides shade and UPF 50+ sun protection. See-through mesh sides on the canopy help you maintain eye contact with your baby at all times, so you never miss a giggle or smile as your baby experiences this watery new world for the first time! Fabric-covered inflation adds durability and the soft mesh seat with secure leg holes provides comfort. A wide base, child safety valves, and dual air chambers enhance security. Includes a mesh play space for splashing and playing with toys. 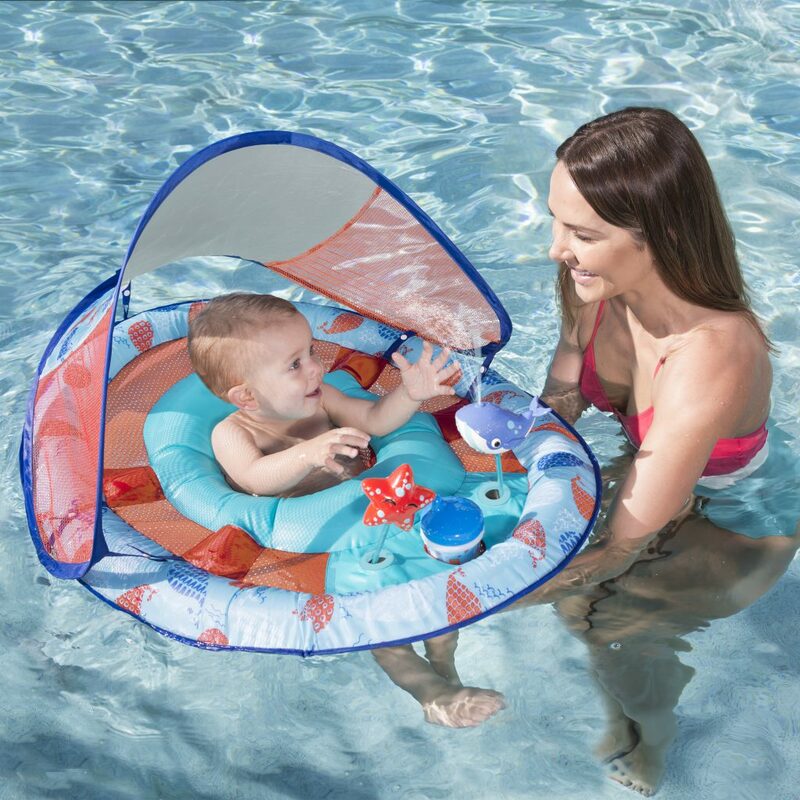 When not in use, the Baby Spring Float Sun Canopy folds flat into three compact circles, making it convenient for storage and travel. Approximate folded dimensions: 13 in L x 13 in W x 3 in H. Approximate inflated dimensions: 34 in L x 30 in W x 3 in H. For babies age 9-24 months. Includes carry tote. Sold individually. Your kids can look like the popular Disney princess, Ariel, from The Little Mermaid at their next pool party! The Disney Princess Mermaid Tail Swim Fins connect together, allowing children to swim like a mermaid, and easily pull apart for an easier, more traditional swimming experience. Kids can begin swimming like a human (with the fins separated), and then turn into a mermaid (by simply sliding the fins in to fit together). Or, start as a mermaid and disconnect the fins to swim like a human- just like Ariel! This fun pool toy will provide your children with the opportunity to engage in lots of fun, imaginative play and create great memories with their friends! The fins are infused with glitter and feature a fish-scale texture for a more authentic feel! For ages 6-12 and best fit shoe sizes 3-5. Dive Characters from SwimWays are a 3pk of soft and flexible dive toys that look like your kid’s favorite characters! This set, our Toy Story Dive Characters, is great for everyday play at the pool, pool party fun, and for encouraging kids during swim training practice. Kids have so much fun diving to retrieve the characters, and they also love to play with them outside the pool for role-playing games. Each set includes three pool toys, one of each character. Each set sold separately. Ages 5+. Kick back and relax on the Swimways Aquaria line’s newest foam float- the Aquaria Pineapple Breeze Lounge! Float along in both salt water and chlorine pools on the cushion-soft and comfortably buoyant float with its oversized pillow! This new for 2019 float comes with an on-trend embossed design in the shape of a pineapple! In addition to these great features, like the other Aquaria floats, it’s made from Aqua Cell foam that resists chipping and peeling and will not absorb water. Color-Fusion Technology permeates the entire float with rich color for a beautiful look as well! This foam float is constructed from the highest quality foam for long-lasting durability, even in the harshest elements including sun, pool chemicals and salt water. For ages 15+ and supports adults up to 250 lb (113 kg). Designed and made in the USA. Sold individually. Go on an underwater adventure with Hatchimals Splash Divers pool toys from SwimWays! Toss the egg into the pool and watch the characters spin as they rise to the surface. The egg opens when it hits the bottom of the pool, releasing three of your favorite Hatchimals characters Draggle, Narwarbler, and Penguala! Play with your adorable characters in the pool, bathtub, and on dry land too. To re-hatch, simply place the dive toys back in the egg, close the sides, and throw the egg in the water again. Who will you hatch? Each pack includes one egg and three characters. For kids age 5 and older.